Severe combined immunodeficiency disease (SCID) is an inherited autosomal recessive disease (meaning that one copy of the defective gene is inherited from a carrier stallion and another from a carrier mare) affecting Arabian foals. Affected foals are unable to produce antibodies that would normally help them to fight infections. SCID foals rarely survive past 5 months of age before they develop an infection and die. 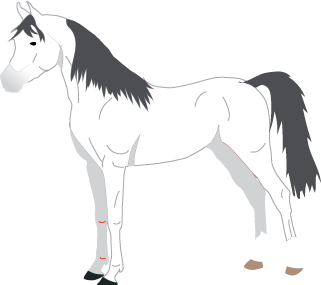 SCID was first reported in horses in 1973. In 1980, SCID was discovered to be an inherited autosomal recessive disease in Arabian horses. Supportive care: May prolong the course of the disease, but affected foals eventually will die, usually within five months of birth. Grave even with intensive treatment and most foals die within five months of birth.